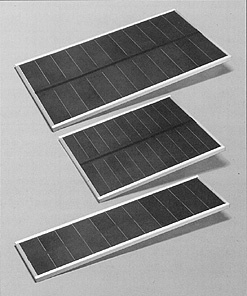 Each UNI-SOLAR flexible solar battery charger uses United Solar's proprietary Triple Junction spectrum-splitting amorphous silicon cell design to achieve high performance. The thin-film cells are made in a patented continuous roll-to-roll deposition process on a flexible stainless steel sheet. The result is a unique, flexible, light-weight cell. The modules are exceptionally durable. They are encapsulated in UV-stabilized polmers and framed with anodized aluminum. A Galvalume steel backing provides stiffness. The polymer encapsulation includes EVA and fluoropolymer Tefzel, a DuPont film similar to Teflon. Bypass diodes are connected across each cell, allowing the modules (excluding the US-3) to produce power even when partially shaded. US-32, US-42, and US-64 modules are equipped with weather-resistant junction boxes to accept 1/2-inch conduit.